"Kraft Program 1934 with Paul Whiteman"
In the 1920s, Paul Whiteman proudly proclaimed himself to be "The King of Jazz," much to the dismay of jazz historians across the country. Definitions of musical styles have changed, and much of Paul's music isn't considered to be jazz as we know it today. Paul did, however, employ many of the jazz greats over the years. In fact, Bing Crosby got his start with Paul Whitman's Rhythm Boys. Over time, other great artists in his band include Tommy Dorsey, Eddie Lang, Johnny Mercer, Jack Teagarden and Red Nichols. Whiteman's musicians were the best paid in the industry, and he was a well-liked leader of the band. He was best known for Rhapsody in Blue, his band's signature song. Paul himself commission Gershwin to write the song, and proudly performed it repeatedly. This collection includes Paul Whiteman's lineup of great shows that he hosted throughout the years. It all begins with Kraft Music Hall, which he hosted from 1933 to 1935. Then he moved to the Chesterfield Hour, and stayed there from 1938 to 1939. 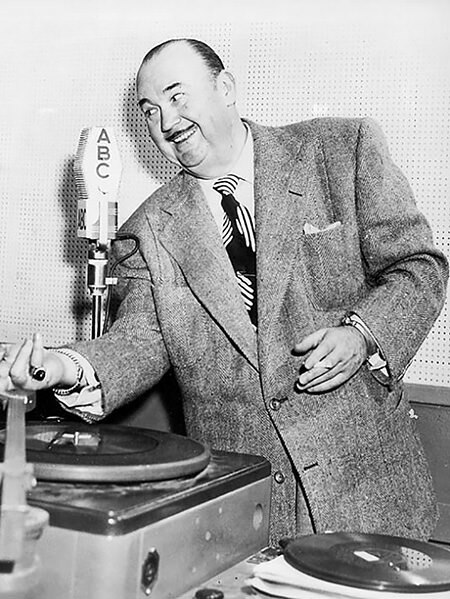 A few years later he hosted Paul Whiteman Presents in the 1943 as a summer replacement program for Bergen and McCarthy. It was a tremendous hit, and starred huge guests each week, including Burns and Allen, Helen Morgan, Jimmy Durante, and Red Skelton. Be the first to comment on "Paul Whiteman"